Astronomers have used US National Energy Research Scientific Computing Center (NERSC) supercomputers to confirm a prediction made in 2010. They found a supernova and a new way of reading the stars. As the yardstick against which outer space is measured, type Ia supernovae are famous for consistency, yet new observations suggest their origins may not be so uniform. Using theoretical calculations and National Energy Research Scientific Computing Center (NERSC) supercomputer simulations, astronomers have for the first time observed a flash of light signaling a supernova collision. This discovery points them to the supernova’s home star system and implies there could be two distinct types of Ia supernova. Type Ia supernovae are significant due to the metric they provide. Their luminosity functions as a constant brightness against which to measure other lights, much like viewing a 100-Watt light bulb on your porch and then from a neighbor’s house across the lake. This “standardizable candle” helps scientists calculate cosmological distances. 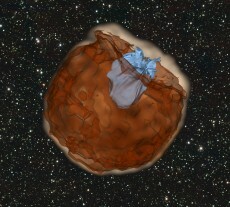 Simulation of the expanding debris from a supernova explosion (shown in red) running over and shredding a nearby star (shown in blue). Courtesy Daniel Kasen, Berkeley Lab/ UC Berkeley. There are two theories of Ia supernova origin: the single-degenerate model and the double-degenerate model. In both theories, the white dwarf star that eventually becomes a Type Ia supernova is one of a pair of stars orbiting around a common center of mass. In the double-degenerate model, the supernova ignites when both white dwarfs merge. In the single-degenerate model, a white dwarf star orbits with a sun-like star or a red giant star, pulling material from its neighbor. The white dwarf expands and its core temperature and pressure increase, igniting a runaway nuclear reaction that ends in a dramatic explosion. In 2010, with the help of US Department of Energy (DOE) Scientific Discovery through Advanced Computing (SciDAC) resources, Kasen made a prediction: In the single-degenerate model, the material ejected from the explosion would slam into its companion star, generate a shockwave that heats the surrounding material, and leave telltale ultraviolet signals in the immediate hours and days after explosion. Recent findings by California Institute of Technology (Caltech) graduate student Yi Cao, lead author of an article published in the 20 May issue of Nature, indicate Kasen was right. Daniel Kasen. Courtesy UC Berkeley. Thanks to the intermediate Palomar Transient Factory (iPTF), which uses NERSC supercomputer machine learning algorithms, astronomers were able to find a recent Ia explosion and quickly train NASA’s Swift Space Telescope to record the ultraviolet signals Kasen had predicted. 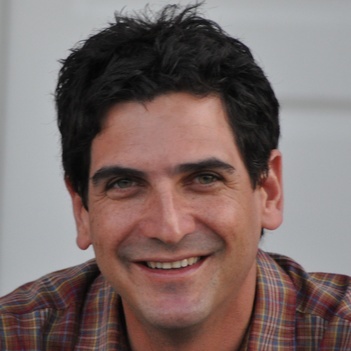 Kasen’s prediction supported the single-degenerate model of supernova origins, but evidence from the iPTF also supports the double-degenerate model. “The news is that it seems that both sets of theoretical models are right, and there are two very different kinds of Type Ia supernovae,” says Sterl Phinney, Caltech professor of theoretical astrophysics. Animation showing a binary star system in which a white dwarf accretes matter from a normal companion star. Matter streaming from the red star accumulates on the white dwarf until the dwarf explodes. With its partner destroyed, the normal star careens into space. This scenario results in what astronomers refer to as a Type Ia supernova. Courtesy Walt Feimer and NASA's Goddard Space Flight Center. Read more about supernova hunting with supercomputers here.